This document provides an outline of the security policies and standards we adhere to. Please note that it does not describe all details. Some information will only be shared with other parties on the basis of a non-disclosure agreement, and we reserve the right to not to share any information that could compromise the security of our platform or our customers's websites. Divio Cloud is built using Django, the Python-based web application framework. Python a language with strict security standards and policies. Python and modules in its standard libraries are subject to very close scrutiny. Vulnerabilities are rare and dealt with promptly. Python code used in web applications is not held in directories accessible to web servers. Deployed code remains behind an application gateway server. Django inherits Python’s advantages and builds on them. Over the years it has earned a particularly strong reputation for very high security standards, thanks to the quality of its codebase and the policies it has adopted. Django provides robust security out-of-the box. Core components and tools such as its authorisation framework permissions framework and templating language have been tried, tested, hardened and improved, on a vast scale, over many years. Django also configures security into its projects by default, and encourages good security by making it easier to do things the secure way. On top of all this, Django’s security layers are readily incorporated into projects: protection against cross-site scripting, request forgeries, SQL injection, session attacks and more all come as standard. As a trusted, large-scale host of Django projects, we receive advance notification from the Django Project about security releases, which means that we are able to have security patches in place before vulnerabilities are made public. A project's web application containers and database are not directly accessible outside our network. All traffic to our sites is directed through our Load Balancers, before reaching the application runners that orchestrate users' containerised Django applications. All levels are redundant, including a performant PostgreSQL cluster and S3 data storage. All connections are encrypted, even within our architecture. We monitor and log activity within and into our systems, and use automated systems to alert our infrastructure team to unusual traffic or behaviour. Details of these systems are not disclosed to other parties. 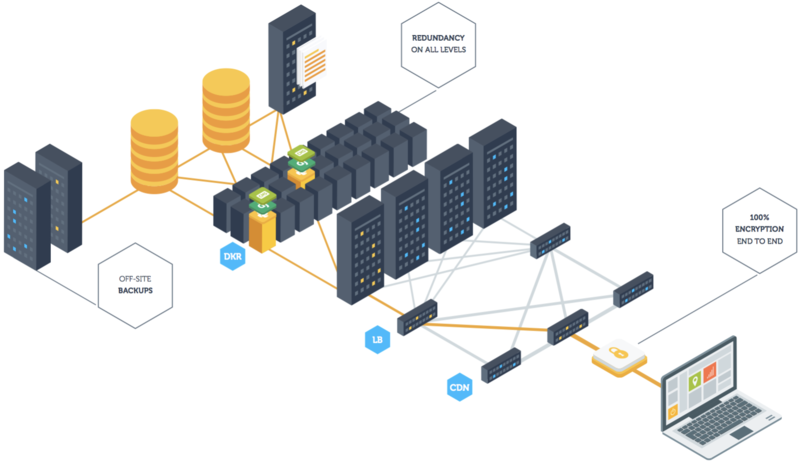 Divio Cloud makes use of known services, such as the the well-protected AWS stack, that enjoy an international reputation for robustness. Details of other providers can be supplied on application, under the terms of a non-disclosure agreement. Divio Cloud uses Docker-based containerisation for deployment, which contributes extra layers of security to our infrastructure. Containerisation isolates running instances from each each other. A vulnerability or even a breach affecting one site remains isolated to that particular instance. Our containerised architecture makes it very easy to apply important software patches and updates. Fresh containers can be deployed to replace ones running outdated software without missing a beat, and we can apply updates - even major updates - to parts of the infrastructure without disrupting services. Similarly, updates can be applied to users' projects without any disruption to service. Finally, the portability of Docker containers means that users’ websites, already safely isolated from the machines and systems that host them, can be moved away very quickly should the hosting system suffer an attack or a breach. Users applications will never be tied down to a compromised infrastructure. Backups are executed automatically (as well as on-demand), stored separately and encrypted. We adopt industry best-practices for security both in our own infrastructure and the Django projects we host for our users. We use well-tested security libraries and do not create our own. We never bypass built-in protections offered by our technology stack, and make full use of them. Divio maintains a formal internal security policy, with which all staff are familiar. This covers such fundamental topics as multi-factor authorisation, reporting, recording, online accounts, handling of physical devices and so on. Some details of our staff security policy can be supplied on application, under the terms of a non-disclosure agreement. Divio maintains a formal Incident response plan, governing incidents are recorded, escalated, dealt with and followed-up. We have a dedicated security team, and encourage responsible reporting by providing dedicated and clearly advertised security contact details. We take all reports seriously and respond to them promptly. We regularly run security tests against our own software and infrastructure. This includes penetration tests run by expert third-party security organisations. Some details of our testing regime and its results can be supplied on application, under the terms of a non-disclosure agreement. Divio is working together with an external audit firm towards ISAE 3000/ISAE 3402 controls reports. We are in compliance with the European Union's General Data Protection Regulation.